NEITHER MB Analysis, MBAnalysis., NOR ANYONE ELSE INVOLVED IN CREATING, PRODUCING, OR DISTRIBUTING THIS PRODUCT WARRANTS THAT IT WILL SATISFY YOUR REQUIREMENTS FOR INVESTING OR THAT THE PRODUCT WILL BE ERROR-FREE. THIS PRODUCT IS DISTRIBUTED "AS IS" WITHOUT WARRANTIES OF ANY KIND, EITHER EXPRESSED OR IMPLIED, INCLUDING BUT NOT LIMITED TO WARRANTIES OF MERCHANTIBILITY OR FITNESS FOR A PARTICULAR PURPOSE OR USE. NEITHER MB Analysis, MBAnalysis., NOR ANYONE ELSE INVOLVED IN CREATING, PRODUCING OR DISTRIBUTING THIS PRODUCT SHALL BE LIABLE FOR ANY DIRECT, INDIRECT, INCIDENTAL, SPECIAL, CONSEQUENTIAL OR PUNITIVE DAMAGES, LOST PROFITS, LOST OPPORTUNITIES OR LOST SAVINGS ARISING FROM THE USE OF THIS PRODUCT. NO PART OF THIS MBAnalysis VALUATOR SOFTWARE MAY BE COPIED OR DISTRIBUTED, TRANSMITTED OR TRANSCRIBED, STORED IN A RETRIEVAL SYSTEM OR TRANSLATED INTO ANY LANGUAGE, IN ANY FORM OR BY ANY MEANS, ELECTRONIC , MECHANICAL, MAGNETIC, MANUAL OR OTHERWISE DISCLOSED TO THIRD PARTIES WITHOUT THE EXPRESSED WRITTEN PERMISSION OF MBAnalysis..
MBAnalysis. AND OR PERSONS OR ENTITIES CONNECTED OR RELATED TO IT MAY BUY OR SELL OR MAY HAVE BOUGHT OR SOLD ANY ISSUE OR ITS DERIVATIVE MENTIONED IN ITS REPORTS. NO PERSON OR ENTITY CONNECTED TO MBAnalysis. OR THEIR FAMILIES RECEIVE OR WILL RECEIVE CONSIDERATION FOR PLACING OR OMITTING DATA IN THIS REPORT. MBAnalysis. RESERVES THE RIGHT TO REVISE THIS VALUATOR SOFTWARE AND TO MAKE CHANGES FROM TIME TO TIME IN THE CONTENT HEREOF WITHOUT OBLIGATION OF MB Analysis TO NOTIFY ANY PERSON OR ORGANIZATION OF SUCH CHANGES. FACTUAL MATERIAL IS NOT GUARANTEED BUT IS OBTAINED FROM SOURCES THAT ARE CONVENTIONAL AND BELIEVED TO BE RELIABLE. THE RAW DATA USED IN PRODUCING THESE REPORTS ORIGINATES FROM CONVENTIONAL SOURCES AND FROM INTERVIEWS BELIEVED RELIABLE AND TRUTHFUL. ERRORS IN CALCULATION, OF FACT AND OF ANALYSIS MAY REMAIN. SOURCES OF INFORMATION ARE BELIEVED TO BE RELIABLE, BUT THEY ARE IN NO WAY GUARANTEED TO BE COMPLETE OR WITHOUT ERROR. OPINIONS ARE SUBJECT TO CHANGE WITHOUT NOTICE. ALL OPINIONS, RECOMMENDATIONS OR SUGGESTIONS ARE GIVEN WITH THE EXPRESSED UNDERSTANDING THAT USERS ACTING ON INFORMATION SHALL ASSUME ALL RISKS INVOLVED. We use a fundamental, bottoms up approach and draw deeply from such classical writers as Graham & Dodd. Our proprietary models have yielded techniques that we have used profitably over the years. These techniques yield an accurate sense of a stock’s Fair Value as well as low and high extremes that should contain nearly all price fluctuation. For Windows Vista XP NT and 95-98 2000-8: From the START menu, select RUN. HIGH - LOW - FAIR Based on current information, FAIR is our calculated Fair Value for this issue. The High and Low are the range of prices that should contain all movement in an issue’s price. Extreme ranging in HIGH - LOW, as well as negative values, should alert the reader to potentially aberrant conditions that have skewed the valuation, thereby questioning it’s validity. We question such issues and their values.. Portfolio List Report is a fully editable report window produced by loading Text File lists. These may be pre defined lists created with any text editor such as Notepad. List One Ticker on each Text Line. To Create or Edit A list Or Portfolio Use the LOAD button to select a Text File previously saved, or type the list into the Tickers window, then select SAVE and name the file. 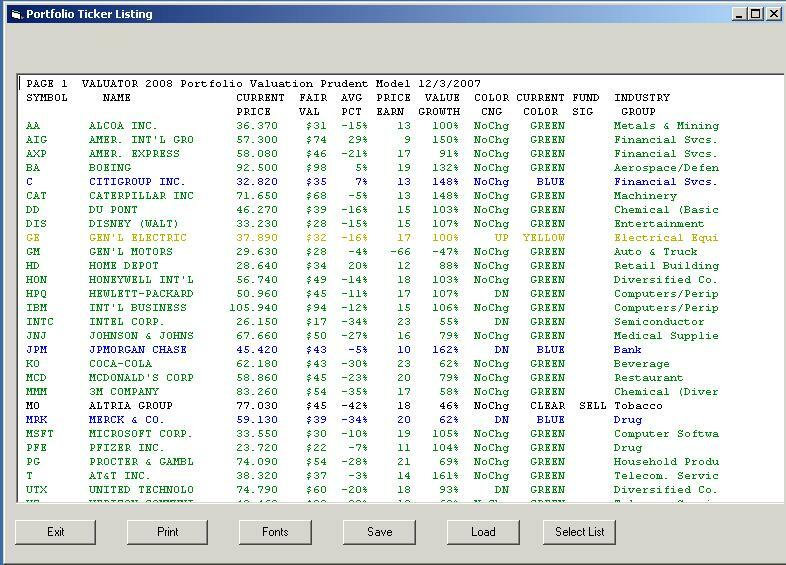 Auto Display Uses the default Ticker File To display the Tickers in the Valuator window. The Auto Display may be stopped by selecting the STOP Button. To use AUTO DISPLAY, select OPEN Icon and choose a previously saved Text File. Then Select LOAD Icon Then RUN Icon. Scroll Speed may be adjusted with the Scroll Speed Slider Control. Alternately, you may select the FAST Icon to Load the default Ticker file and display will begin. To DISPLAY a portfolio Report Press DISPLAY PORTFOLIO Button and Select the Text File containing the ticker list. Portfolio Report window will Open and Display the list of all Found Tickers. You may choose any of the REPORT FORMAT choices for PRINT or DISPLAY functions. You may Also Select COLOR DISPLAY Check Box to determine whether or not display will be shown in color. EXIT Button or EXIT Icon will close this window and return to main Valuator window. You may choose any of the REPORT FORMAT choices for PRINT functions. You may Also Select COLOR DISPLAY Check Box to determine whether or not display will be printed in color. Remember Wide Reports will need to be printed in Landscape Printer Format in order to display correctly. Display Portfolio is a fully editable Rich Text Format window. The results may be SAVED to a File in either RTF or TEXT format. Saving in Text Format will not retain color settings, Saving in RTF format will retain color. EXIT Button will CLOSE the Display Window. PRINT Button will allow printer selection and will print window contents to your printer. FONTS Button will Display Font Selection Boxes to directly edit the text in the window. DEFAULT Button will allow you to Select and Retain new default font settings for the Display Window. Remember, to use a FIXED PITCH font such as Courier, or the display may not retain proper column alignment. Click CHECK FOR NEW DATA Button If the database is current, it will indicate the file already exists. Download Access DB will Download the new database, or replace the current Database by the name shown. Any new Program Update Available will Enable The Program Update Button for Download. The Advanced Settings Panel allows the user to change the Internet Database retrieval settings. These should only be changed with guidance from software support. This panel is available to help assist in resolving any Internet Connection difficulties. This panel may also be used to change your USER ID and PASSWORD settings. DONE Button will return to the Internet Database Update Window. Occasionally Program Bugs Surface That Were Not Caught In The Beta Test Versions. Send Us An Email Describing The Problem To: valuator@mbanalysis.com And An MBAnalysis Software Programmer Will Respond As Soon As Possible. The Advanced Tab on the Default settings panel will allow the reset of all program default values. Press RESTORE ALL DEFAULTS Button the restart Valuator program. The discount values for all present value calculations may be altered. Prudent Model discount rate is set by variance of the Left Slider. Aggressive Model values are set by variance of the Right Slider control. Reset To Default will restore the default values originally supplied. The Database Tab shows the location and name of the Current Default Database Filename. Program Update Checking may be ENABLED By Checking Valuator Program Download File Support Check Box. Program Update Checking may be DISABLED By Un Checking Valuator Program Download File Support Check Box. The Internet Update Tab Reflects the values set with the Advanced Settings Panel of the Internet Connector Database Updater. Do Not Change These Settings unless Instructed by Software Support. Changes may affect your ability to Check for and Update your database from the web site. USER ID and PASSWORD may be reset here. The General Tab Allows the user to Enable or Disable The Auto Cursor function set at Program Startup. Allow Resize For Valuator Window allows the main valuator window to be enlarged or reduced. Ó 1997-2008 MBA Financial Publishing Inc. All Rights Reserved. Version for the x86 platform is available directly from MBA Financial Publishing Inc.